This is a true incident that happened on the evening of November 24th. However, since I did not take permission from her, allow me to change her name. She is my colleague; and let's call her Shalini. Have you seen street urchins throw stones at buses on the road? I have, but havent bothered about it much, coz it seems to be just children throwing small stones, most of which do not reach the moving vehicle. But what happens, if the stone is comparatively big, and it hits the glasses? After a long day at work, Shalini was going home by a bus, when this happened. 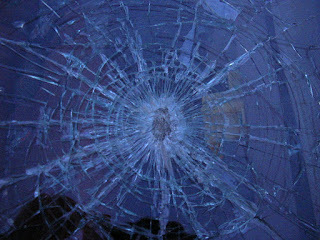 Someone threw a stone at the bus, and the projectile broke through the glass and hit her right on the face. Poor girl, she was not even on the window seat and fate had selected her. Feeling blood, she screamed for the first aid box. Luckily there was one on the bus, and few fellow passengers helped her to clear the glass bits. Any other person in her place would get numbed in this situation, but her sharp brain quickly estimated the most prominent location where she could call her parents to. She asked the driver to start the bus, while someone called the police. In fact, they met the police on the way. The men asked the women on board to help them in carrying Shalini to the police, but no one came forward. Clutching her cell phone and purse, Shalini had to walk to the car herself. Her spectacles had fallen somewhere, perhaps broken too, but she could not think about them right then. Since she was bleeding profusely and her eyes hurt, she was sure that she needed medical attention urgently. She asked the police to take her to a hospital, and inform her parents at home. Two people from the bus volunteered to be with her all the time, till her parents arrived. The government hospital where the police had taken Shalini gave her very limited care, and wanted her parents to take her elsewhere for some tests since their own equipments were out of order. This was when they decided to shift her to a private hospital close to their home, and at least, where all facilities were under one roof. Her brother, much elder to most of us, took charge hereafter and completed all formalities. It was much after the incident when we came to know about all this: next morning. When we rushed to the hospital, her face was swollen and cut; and we could hardly keep ourselves steady. Her mother told us that this was a much cleaner look, while Shalini jokingly told us how she vomitted everywhere: in the police car, government hospital and also after her admission to the private setup. We were relieved to see that Shalini was out of the trauma of the incident. She is young and unmarried, and we were worried that a face injury could disturb her future. She would be undergoing surgery soon to set right a few cracked, displaced and depressed bones... and only time will tell how she sails through this. A sharp and brave girl that she is, Shalini would be back with a bang! P.S: My appeal to all of you is that please condemn such incidences... they prove nothing, yet hurt inncocent people. Why throw stones at buses? And if someone is hurt, please come forward and help. Delay on your part can cause a life loss, even. Shalini (actual name: Rupa) has written about her experience in detail. Read it here on her blog. OMG!!! This is so so so very bad!!! I mean, it is outright crazy... And I am really worried bout the vomiting part of it! That is not a good sign and shows severe head injury! Hope she had a scan is well on her way to recovery!!! Prayers!!! oh1 my god..i have not been spectator to such stone throwing..but if these things happen, it's sad...and am glad that her courage plus some help from strangers got her to medical help faster..
who says delhi people are callous towards others(yes there are few bad eggs) but..on the whole people are good!! Indeed a brave woman, your colleague. I wonder why the women in the bus didn't volunteer to help. Such apathy never ceases to surprise! But your friend is rather brave - wishing her a speedy recovery. Shalini's surgery has happened yesterday, and she lies in hospital with 4 titanium plates fitted on her face, below her skin. She is presently bandaged up, but we are hoping for a speedy recovery. yes indeed a brave woman..wishes for a speedy recovery..
Hi Anupama, Came in through Niranjan's post.Was horrified to read about the ugly incident that happened to your friend Shalini. Must have been very traumatic with little cooperation from co passengers or the police or even the Govt Hospital ! Value systems have changed so dramatically over the past few decades - people have become insensible & indifferent. A murder took place at a traffic signal in Coimbatore in broad daylight some months back and pedestrians simply turned a blind eye. The guy died, but had he been rushed to hospital in time his life could have been saved. Lets pray for Shalini's speedy recovery and hope the surgeon has done a skilful job so that her face is scar free! Its time we take a strong look at our own selves... what are we heading at? Things we turn blind towards, may happen to any one of us, isnt it? Ramesh, yes. She would be discharged from the hospital today. Phew!!! I remember an incident when we had visited Agra during our college days...a small group attacked our city bus and smashed all the glass windows...the driver had the presence of mind not to stop and drive straight into a nearby police station. Luckly we escaped with bruises...traumatic experience though! Wonderful blog! Do you have any tips and hints for aspiring writers? I'm hoping to start my own website soon but I'm a little lost on everything. Would you advise starting with a free platform like Wordpress or go for a paid option? There are so many choices out there that I'm totally confused .. Any suggestions? Appreciate it! First time on your blog. Hope to see you in tomorrow meet. Please visit my blog,if you like Hindi blogs. Ohh i am really shocked to see the apathy shown by the women travelers....at the same time we know it's nothing new. I hope your friend is fine now, she handles it all so bravely...kudos!! this is really unfortunate. so sad. i see its been a month since you posted this. hows our friend now? Shalini is much better now. She has joined work.. but she is still weak, part of her face is still swollen, her teeth hurt when she eats... but the good news is that, she is recovering!